There is a fair amount of confusion when discussing the terms Semi Frameless and Frameless shower enclosures. For example, our lead shower enclosure project manager at Insight Glass recently told me we need to stop referring to our heavy glass enclosures (3/8” or 1/2" glass) as frameless when we install them with U-Channel as the customer is confused when they see the metal. Customers are also confused when we install a semi frameless shower enclosure and they see metal around the entire enclosure. So, with a few pictures and some descriptions, hopefully we can clear this up as the last thing we want at Insight Glass is a confused customer. 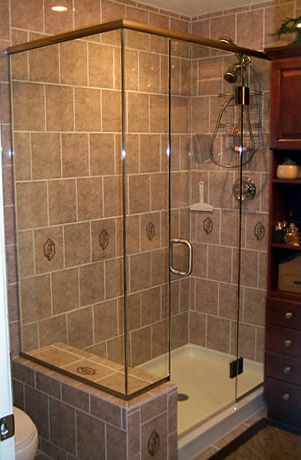 A Framed shower enclosure is pretty simple to define – It has metal around the entire structure – Including the door. See the picture to the right and note the metal around the door. 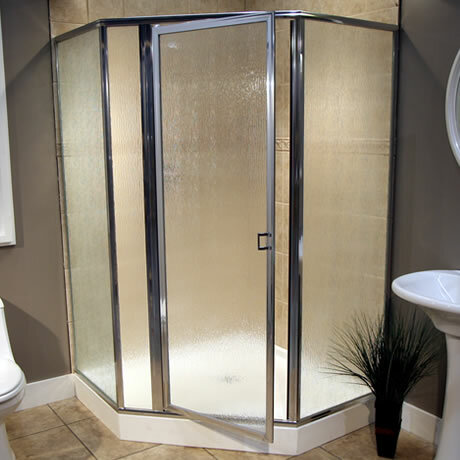 A Semi Frameless shower enclosure also has metal around the entire structure, but does not have metal around the entire door – Thus the term semi frameless. See the picture to the right and note the metal around the door is only on the bottom to control drip. A Frameless shower enclosure is a little more difficult to define as it may have metal (u-channel) around the fixed panels and it may even have a header for safety/support reasons. In order to qualify as being frameless, the glass thickness must be 3/8” or 1/2" and the door must be attached by hinges only – no metal around the door. 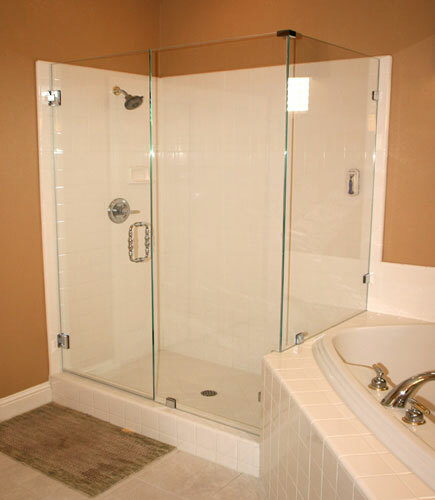 See pictures below of shower enclosures that are all considered Frameless. The picture to the right is a frameless shower enclosure. Note the door is attached by hinges. Clips are used on the fixed panels. Heavy glass (Frameless) enclosure with door attached to fixed panel, u-channel, and a header. Note: A header is usually required for security/support reasons when attaching the door to a fixed panel. Frameless Neo Angle enclosure with a header. A header is usually required with a Neo angle enclosure as well for security/support reasons. 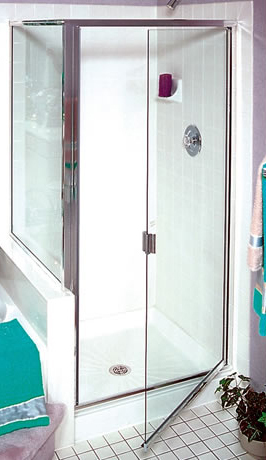 As you can see, there are various types of frameless shower enclosures. The use of u-channel or a header does not disqualify a shower enclosure as being termed frameless, and often, customers prefer the look of the u-channel and header as it complements the bathrooms existing hardware. 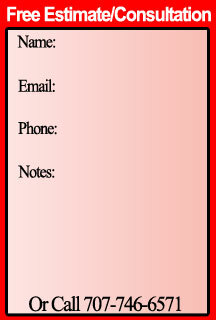 If you have any more questions, please call us at (707) 746-6571 or take a minute to send us a quick email. We would love to hear from you.